Late music mogul Don Arden, manager of the Small Faces and father of TV celebrity Sharon Osbourne, has been honoured with a central London plaque. 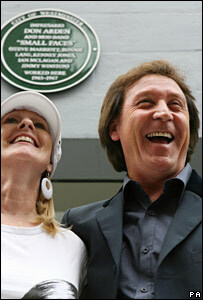 Small Faces drummer Kenney Jones unveiled the plaque on Saturday, at the site of the Carnaby Street office where Arden signed the Mod band in 1965. Arden died in July aged 81 after developing Alzheimer's disease. Fans raised £400 to pay for the plaque after approval from Westminster City Council. The Small Faces are best known for the hit single Itchycoo Park, and Saturday's ceremony coincided with the band's annual convention. Arden is also credited with steering bands ELO and Black Sabbath to stardom. X-Factor judge Osbourne became estranged from her father after fighting him for control of husband Ozzy Osbourne's career, but the pair were reconciled in 2002.